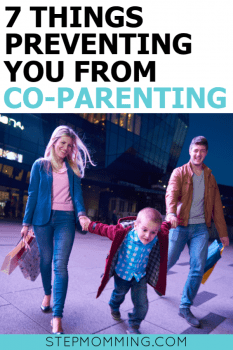 Whether you’re married, separated, estranged, divorced, broken up – whatever the relationship – the fact is, parenting is coparenting. Even if you seemingly don’t agree on anything, chances are you both agree on putting your child(ren) first. Successful co-parenting is vital when raising self-confident children secure in their environment. It can heal a broken home, make parents a united front, leads to a happier home life, and helps children cope with the fact that their parents aren’t together anymore. 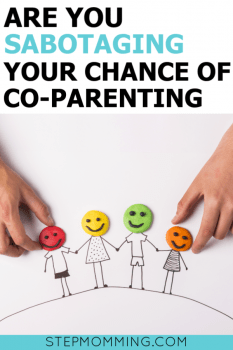 Co-parenting allows two parents, who might not like each other very much, to put their differences aside to focus on their child’s wellbeing first and foremost. But what if things seem impossible to work out between you and your ex? What if you just can’t get along? 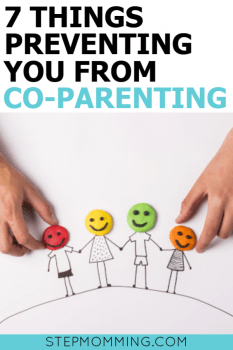 The truth is, it takes (at least) two to tango when it comes to successful (and not so successful) co-parenting, much like it took two to create those beautiful children. Have you stopped to think for a second about your own part in the disagreements? About whether you’re contributing to the problem? There are always two sides to every story. And to hear anyone talk about “the other parent” when there are problems, both sides tend to think it’s the other one’s fault. We only ever have control over what goes on on our side of the fence. No matter how anyone else acts, we want to make sure that we aren’t contributing to any co-parenting-sabotage. It can happen even without us realizing it! You may have one monster of an ex spouse who is determined to make your life hell (or so you think) but have you stopped to think about whether you’re adding to the chaos? And if we want what’s best for our children, then we absolutely must look at it from all angles – including the possibility that we may be part of the problem. The first part in solving this parenting dilemma is recognizing anything you may be doing to (perhaps unintentionally) “sabotage” you and your ex’s parenting relationship (this includes your relationship with stepparents!!!). So think objectively when you approach these topics! If you were outside looking in – what do you see? 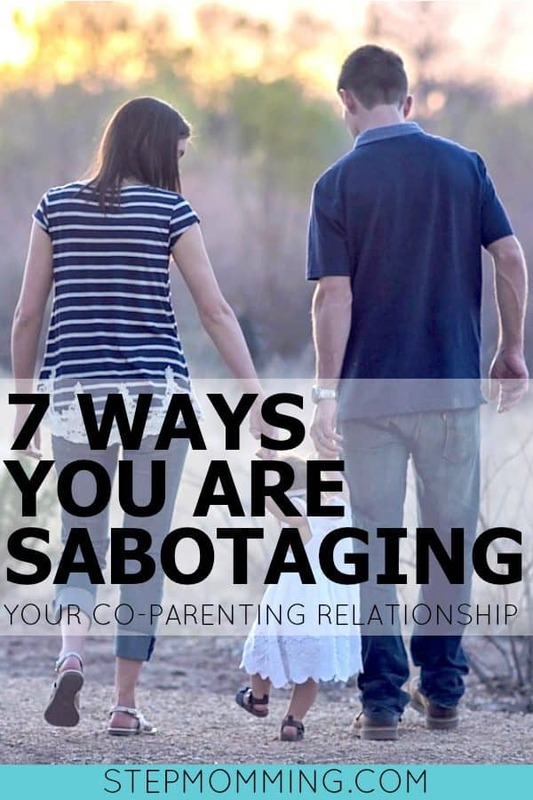 Take note: 7 major contributing factors that will sabotage your co-parenting attempts are: jealousy, anger, selfishness, slander, irresponsibility, guilt and manipulation. Do you know what these look like? Below are 8 different examples of ways you are contributing to the problem. 1. Making a child feel bad for loving the other parent. I don’t care what that man or woman did to you, your child is still one half of their being. And regardless of what you might think, it’s more than likely that your child loves their other parent just as much as they love you. Shocking? Not so much. Your son or daughter may act like they agree with you when you talk about what a “terrible person” their father might be, but that’s not going to stop them from loving their dad. Love is a funny thing. It can make you forgive a person for something you normally would never get over. The point is, don’t try to manipulate your child into feeling bad for loving their mom or dad. All you’re doing, is hurting one of the people you love most in this world. 2. Talking bad about the other parent. You may be angry or viciously upset by something your ex (or even your husband) did, which may cause you to want to talk badly about them in some therapeutic rant. Never, ever do so in the vicinity of your child(ren). This slander against the other parent only confuses them. It’s one thing to talk about a mistake your husband made to your adult children who totally understand where you’re coming from, but it’s another thing entirely to share marital troubles with your middle-schooler. They don’t need to know. Spoiling your sons or daughters is just plain irresponsible, and not at all conducive to raising humble, well-rounded and successful adults. While some divorced parents may intentionally try to “one-up” their ex, many others end up spoiling their children simply because they feel guilty about not spending more time with them (source). This often happens not only with parents who have separated, but also when one parent travels a lot. But just throwing money at a problem, doesn’t help the situation. It seems to be some running joke that children of divorce “get everything they want” including two birthday parties, countless Christmas presents, with the mentality that “if Mom won’t buy me what I want, I’ll just ask Dad” and the list goes on. Stop it! This is only hurting your children and their potential in life. Get on the same page with your ex for the good of your kids. Open those lines of communication to create a united parental front. 4. Not following through on agreements or arrangements. If the two of you agreed to pickup or drop off at a certain time or place, be responsible and stick to it. Not only does this show respect to the other parent, but it also helps create the ever-crucial consistency your child craves in their routine. Skipping drop-off only leads to drama (and possibly police involvement) you don’t want, and ignoring an extra curricular activity can make your child feel less important than they really are. Neither of these situations foster healthy development or relationships. 5. Threatening to take your child away. As we touched on before, your child loves both their parents, regardless of your feelings on the matter. Threatening to take them, or time with them, away from the other parent to manipulate a situation in your favor, is selfish, and can lead to anger, drama, and drastic measures. Not only by your co-parent, but your child as well. Avoid the drama, and try a more diplomatic approach when disagreements arise. *That being said, if the other parent is creating a dangerous environment for your child, of course it’s okay to notify the authorities and/or set barriers in place. When you’re raising kids between two households, it’s imperative that you compromise. Two households come with two family schedules, two lists of needs, two calendars full of important dates. How do you work on making those two schedules fit together? Communication and compromise. Don’t let anger cloud your ability to put yourself in the other parents shoes. Remove yourself from the situation for a moment, and look at things objectively. 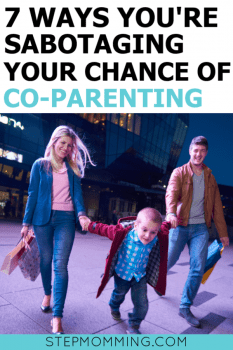 If you were in the other parent’s current position, and had an important event coming up that you wanted your child to attend on a day you weren’t normally supposed to have them… wouldn’t you hope that you two could come to a compromise and perhaps swap a few days around? 7. Making decisions as an individual instead of as a team. It happens all the time – one parent decides their son or daughter will take a certain class, or go to a particular school, without ever consulting the other parent. 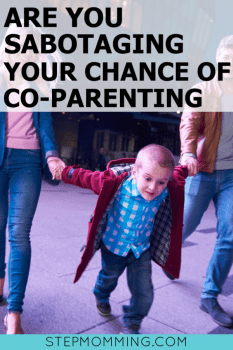 In fact, they may inform their co-parent in a matter-of-fact way that “this is happening” whether they like it or not, and everyone just has to deal with it. 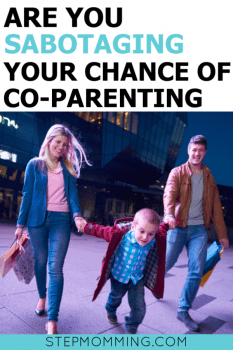 While it may be completely within a single parent’s right to decide where their child attends school, making all the decisions on your own does not promote the teamwork required for successful co-parenting. A simple discussion about the issue or topic among parental figures, hearing each other’s thoughts and making a decision together, will not only encourage a positive relationship but will also keep you all (happily) on the same page. While it’s true that not all parents desire to get along with their ex-spouses, or their children’s stepparents, (and yes, I realize not all ex’s make things easy) if you desire a healthy co-parenting relationship, then make sure you’re not standing in the way of success. And if you’re a sabotaging culprit, take steps to resolve the issues! Open those lines of communication, mama. Be honest with yourself, and the other parents. 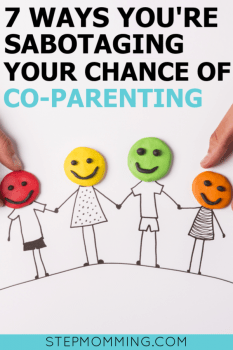 If you’re ready to give successful co-parenting strategies a try, read more HERE! Great article!!! I have shared this one with many of my friends. I love that you 4 are co-parenting K-1 with lots of ❤️ love.